Four Star Sales / Posts tagged "Saratoga Selected Yearlings"
Four Star Sales, agent, consigned the colt on behalf of his breeder, Ben Sangster of Swettenham Stud. Fasig-Tipton Saratoga released its 2015 select yearling catalog June 24 and the sale features 209 yearlings, an increase of 27% from last year’s sale. 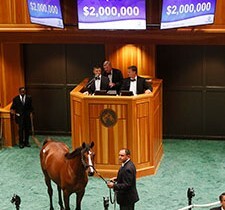 The 95th edition of the sale will take place Aug. 10-11, in the Humphrey S. Finney Pavilion in Saratoga Springs, N.Y. Sessions will begin each evening at 7 p.m. 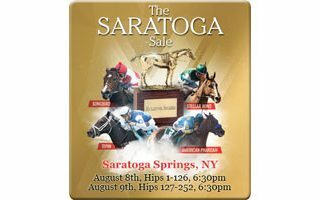 The Saratoga Selected Yearling Sale catalog is online and available on our website. The Saratoga Selected Yearling Sale will be held on August 5 – 6, 2013.